To furnish the varying desires of our customers, we are immersed in offering a world class consignment of Wedding Food Stall. 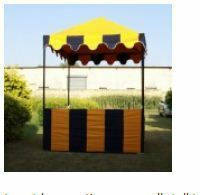 In outdoor parties, our small stall tents give the proper shade and presentation to your dishes. It comes in different shapes and sizes, according to your requirements. These are also known as Market Stall Tents. 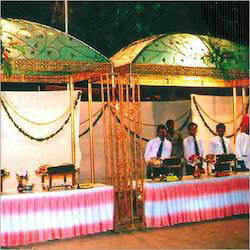 We are one of the prominent manufacturers & suppliers of a comprehensive range of Food Stalls that is widely used in wedding parties. Our range is highly in demand due to its sturdy construction, smooth texture, dimensional accuracy and fine edges. Further, our range can also be customized as per the specifications detailed by the clients to meet their exact requirements. The Marriage Food Stall, which we present to our clients is comprehensive of high quality and is widely acknowledged in the market due to their affordable pricing. We are the leading provider of Decorative Stall These products are identified amid patrons for their noticeable features such as longer life, durability and nominal cost. We are also immersed in offering a broad gamut of Wedding Stall to our patrons. Using exceptional-quality basic inputs, these are designed and made up in tune with the guidelines laid down by the market. In addition to this, we present these to our patrons at the leading-industry rates. Decoration for all types of Food Stalls. Latest and Unique decorations for all types of Food Stalls.